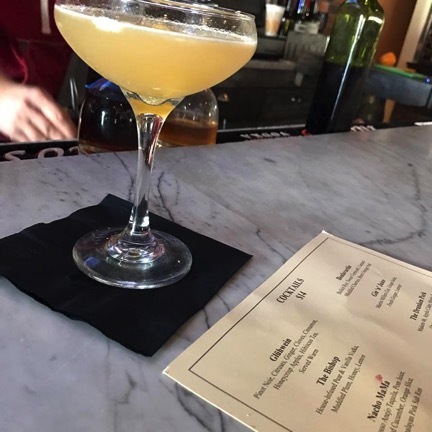 As bars and restaurants with craft cocktail menus are on the rise, Huntington is becoming a hotspot embedded with places to imbibe creatively constructed drinks. True North, an American Gastropub, is known for their phenomenal food menu and large craft beer selection. 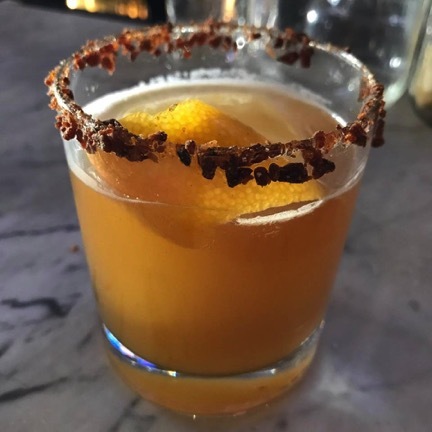 But what you may not realize is that Chef Paul Miranda is always reimagining their seasonally designed cocktail menu to highlight the feels and flavors of that particular time of year. I have a hard time adjusting to seasonal drinks and food. After August, I feel like I search out summer drinks longer than I should. “Let’s just have a margarita and pretend it’s still summer,” said me in early November. By Thanksgiving I’m starting to look for pumpkin and fall flavors and then, BAM, it’s ten days until Christmas. In search of that warm, holiday feeling, I set out to True North. Their seasonal cocktail menu was precisely what I’d hoped for. 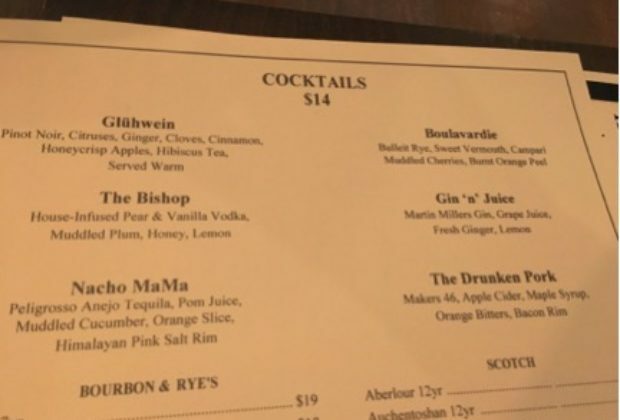 Since it seemed like I was still frozen from the ten second walk into the restaurant from the car, I started off the night with a hot cocktail: the “Glühwein”. Glühwein is German for mulled wine (think hot, delicious sangria.) Pinot Noir is the base for a medley of winter spices and hibiscus tea. Strong flavors like cloves, cinnamon and citrus really came across well balanced with floral essence. The bits of Glühwein soaked Honeycrisp apples were a fun treat to eat when the drink was finished. 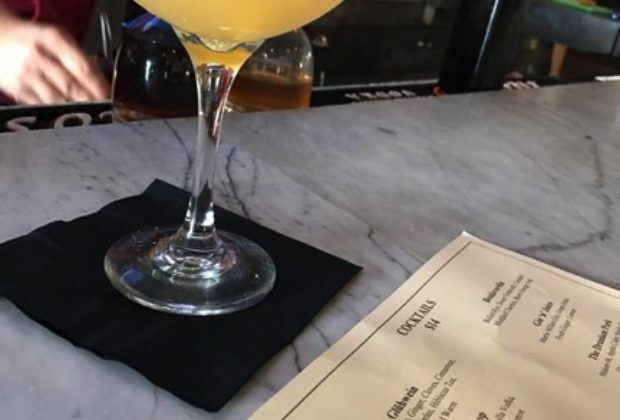 The “Boulavardie” is the old school, classic cocktail Miranda chose to feature on the winter menu and I love it. Cousin to the Negroni, the “Boulavardie” is strong, smooth, and satisfying. 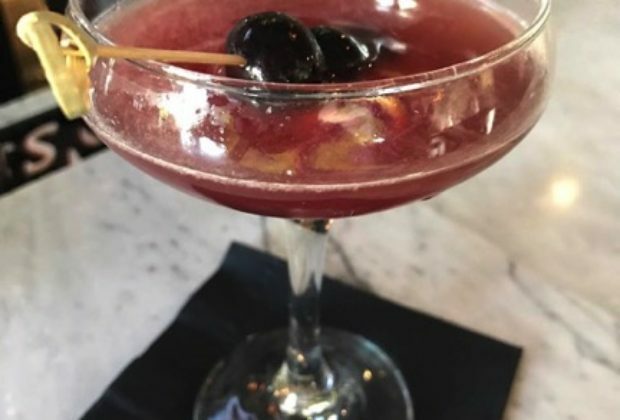 Made with Bulleit Rye, sweet vermouth, and Campari, Miranda also chose to include a muddled cherry and burnt orange peel, which is such a great addition. Burning the peel releases oil, which is a little mellower in citrus flavor and offers more of a smoky complexity. I realized what was about to happen when I ordered my next cocktail: a pork hat trick. Should I be impressed? Ashamed? 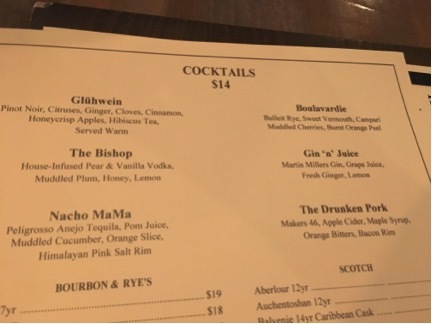 “The Bishop” and the “Gin ‘n’ Juice” were just what I needed as the food came and I was looking for something with a little less octane. Both cocktails are the perfect solution for anyone who is looking for something not too boozy in taste. Grape juice is an ingredient not commonly seen in a bar and Miranda has used it alongside of some fresh ginger and lemon to compliment Martin Miller’s Gin perfectly. The “Gin ‘n’ Juice” makes the ultimate “grown-up juice” for sure. 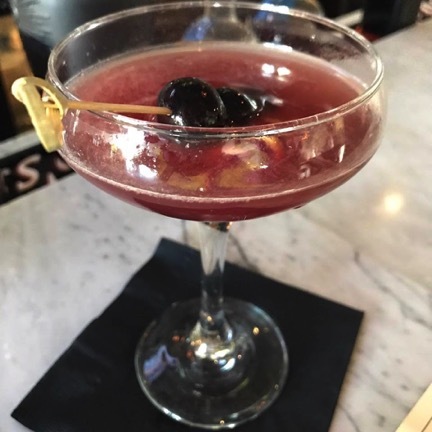 “The Bishop” is made from house-infused pear and vanilla vodka, honey, lemon and muddled, local plums. It drinks sweet but not cloyingly so. The vanilla, honey and lemon are the stars of the show in this one and it’s easy to imagine this drink being something to sip on before bed on a chilly night. After having the Korean BBQ Pork Buns and the Ramen with Pork Belly and Shoulder, I realized what was about to happen when I ordered my next cocktail: a pork hat trick. Should I be impressed? Ashamed? Well, “The Drunken Pork” showed up with a bacon rim and I just let it happen. Served over one gigantic cube with a lemon twist, it’s crafted with Makers 46, local Maple Syrup, cider from Jericho Cider Mill, and orange bitters. Not being much of a bourbon gal, I was skeptical…but I was also pleasantly surprised. The inherent flavors of the maple and cider really brought out a quality in the bourbon that I was able to appreciate. 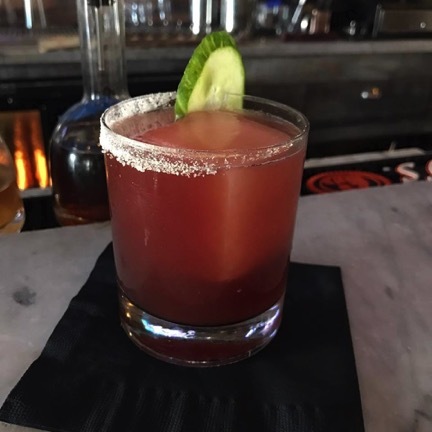 Rounding out the evening I found myself with “Nacho MaMa.” Peligroso Anejo tequila is mixed with Pom Juice and muddled cucumber. The refreshing cucumber is a perfect nod to summer while the Pom Juice embraces the feeling of chillier weather. 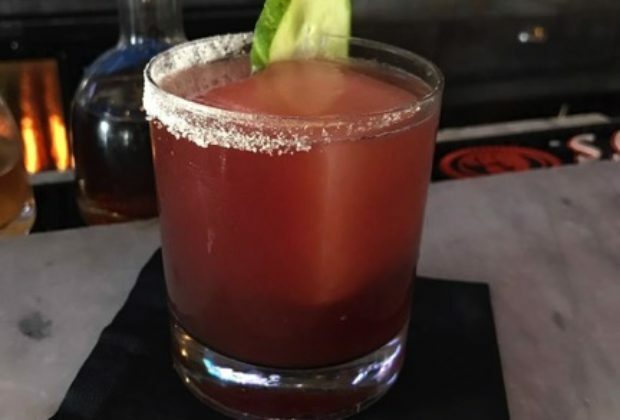 Rimmed with Himalayan Pink Salt, “Nacho Mama” is a welcome winters day version of a margarita. 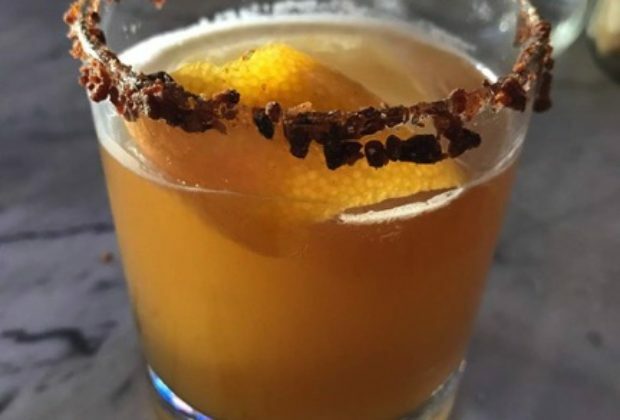 While I wouldn’t necessarily recommend consuming the entire cocktail menu at True North in one night (not that I’d be one to judge), the good news is that there is plenty of winter left to work you way through their brand new seasonal menu. Sara Pesserillo has spent upwards of 14 years in the restaurant industry and generally needs to buy new work sneakers (but doesn't.) In a perfect world, you'll find her at a bar where the drinks are served by puppies and there is a never-ending supply of cheese dishes.